Bocandy is a new subscription treat service (those seem to be popping up all over the place!) that specializes in international candy. I love trying international treats, but they can be hard and/or expensive to come by, so I was super excited to get a free Bocandy sample to see what they’d send. I got a red mailer envelope with a plethora of treats, some of which I’ve reviewed before (tiny Haribo gummis, Walker’s toffees) but also some new things I’d never tried. This week, I’ll review a couple of Eastern European treats, starting with a ROM Cel Mare bar from Romania. The ROM bar has a fascinating backstory (covered here by Fast Company) – they once used reverse psychology to up sales by replacing its Romanian flag wrapper with an American flag one. Romanians got mad and protested. 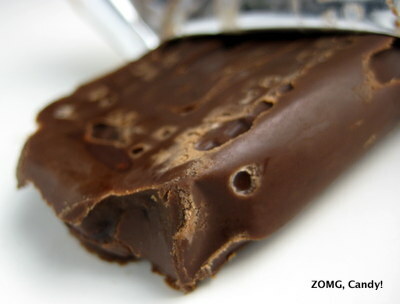 When they returned the ROM Bar to its original Romanian wrapper just a week later, sales went up! My ROM arrived melted (darn North Carolina summers!) 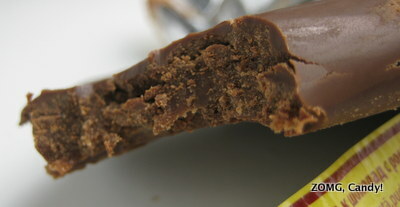 but reconstituted itself fairly well into a softly solid bar of chocolate. It had a unique flavor profile – a little toasty wafer note to start, then a very strong fruity booziness that was set off quite nicely by the chocolate. It turns out that the Cel Mare variety of ROM has a rum-flavored middle, hence the booziness. I loved it! It was just the right amount of alcoholic flavor to be noticeable but not overwhelming. An OM. If you want to try Bocandy for yourself, you can get a free sample if you pay $3.50 shipping. They’re also currently running a giveaway of 3 year-long subscriptions. Check them out! They’re a candy reviewer’s dream because you get a little taste of lots of things, and it’s way cheaper than international shipping or airfare. Is chocolate the way to stop overpopulation?